Please click the thumbnail images below to view larger versions. If you would like higher quality copies of the images for your own use or use in your own church please contact us for details. 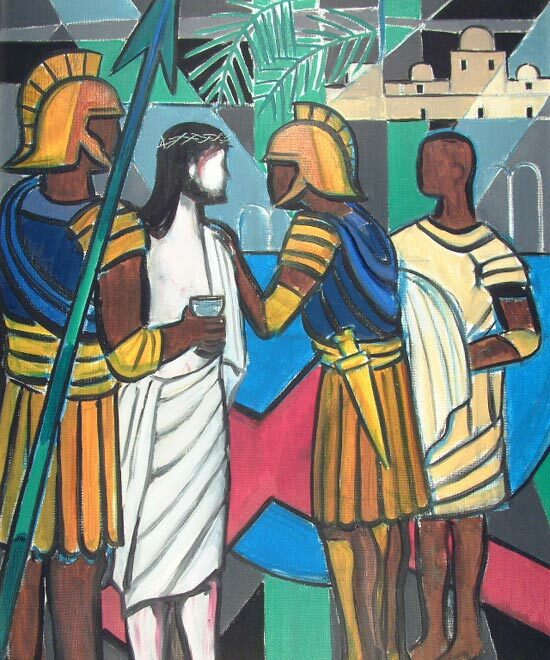 Pilate places his hand in a bowl of water, seeking to wash his hands of guilt in condemning Jesus to death. 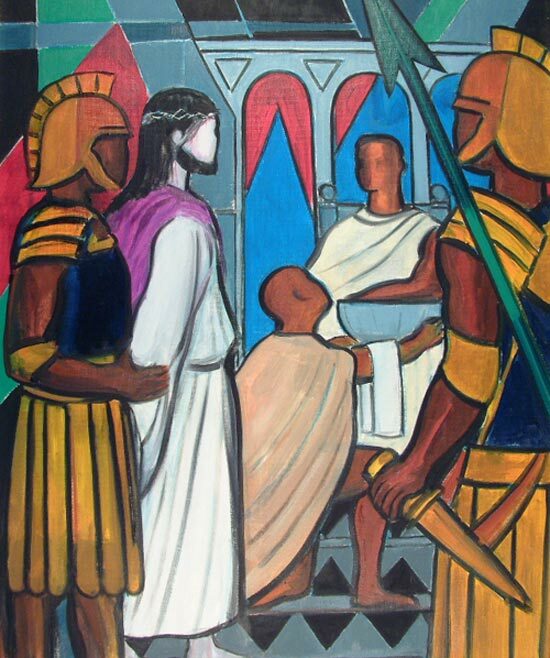 The servant holds a towel over his arm for Pilate to dry his hands on. 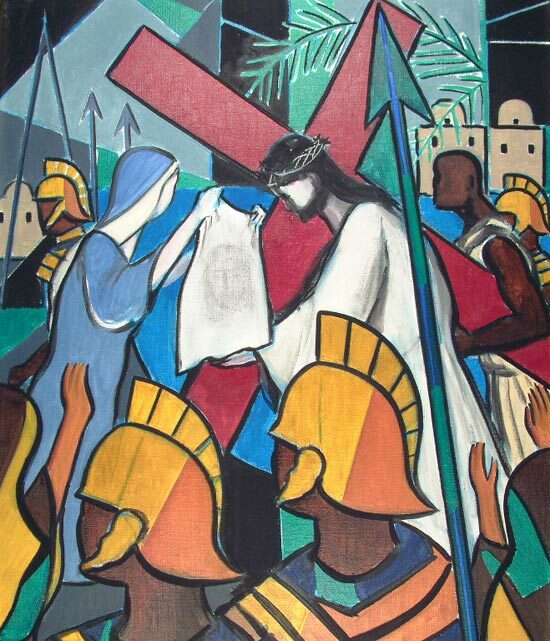 Jesus has already been mocked by soldiers in an out-building of the palace, where they placed a purple cape on his shoulders and platted a crown of thorns to place on his head. The action of the scene is in the centre of the canvas. 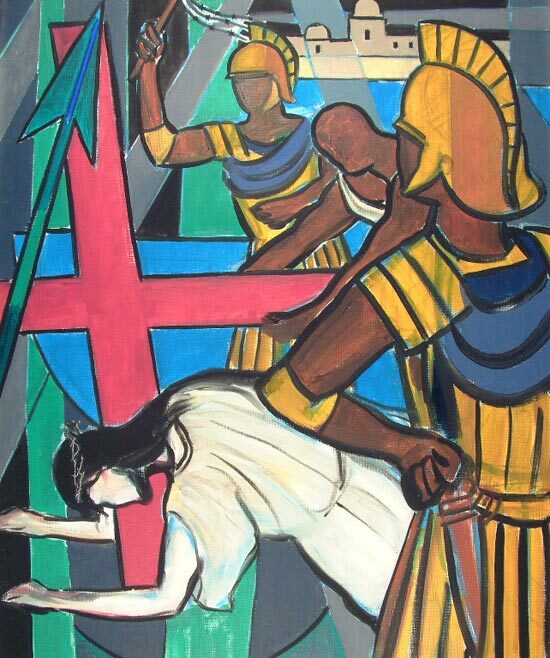 Lines tend to lead into the picture and even the short sword of the soldier can be followed up to the servant, whose arm then leads up to Pilate. The green spear helps to bring a deep-green colour across the painting making sure that the eye is not led out of the picture. 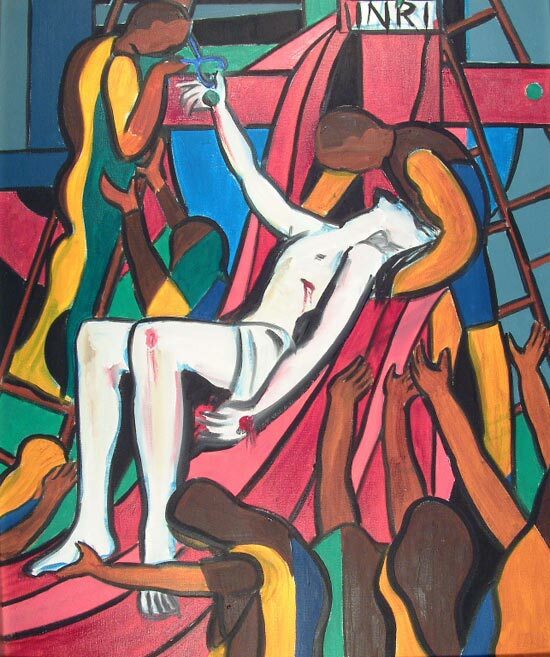 The red contained in the curtains and background helps to relate this painting to all the others, which are depicted with the cross of Christ, also painted red. The red in fact denotes blood and passion and symbolises the Cross of England rather than a more Roman or Mediterranean conception. 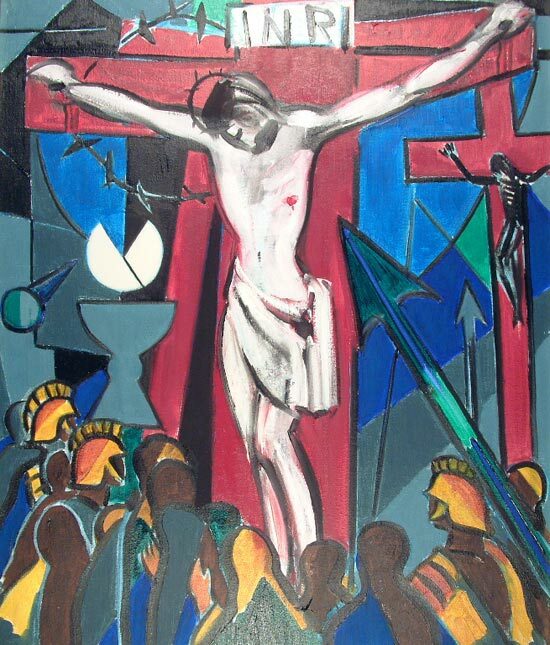 Jesus feels utterly alone and understands the enormity of actually handling the cross, the instrument of torture on which he is to face an agonizing death. People are around him but for a moment he hardly notices them. In the background there is some suggestion of Eastern buildings that he hardly sees. He is deeply in prayer as the soldiers begin to move him on to the place of execution. 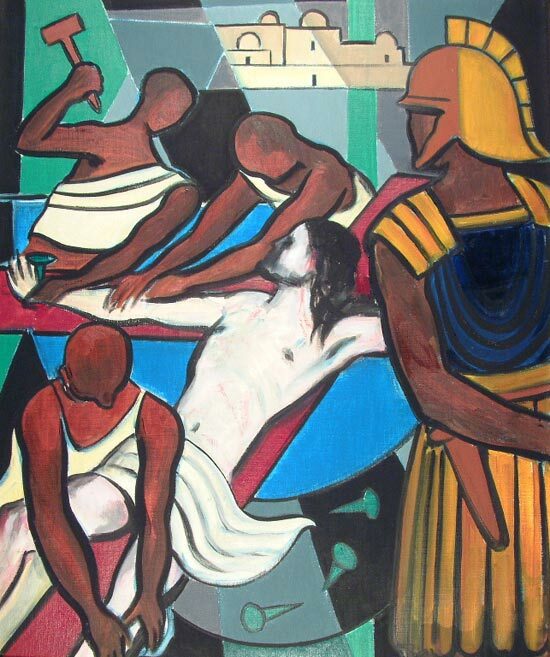 Jesus is weak from lack of sleep and from the cruel treatment inflicted upon him by the soldiers. He stumbles to the ground and some of the faithful women followers of Jesus watch helplessly, with pain in their hearts. One soldier whips him with a knotted thong whip, which makes small and painful gashes in his body, forcing him to struggle to his feet. Mary stands in an attitude of offering, because she is one with the Father in offering her son and is at the same time part of that offering of agony. 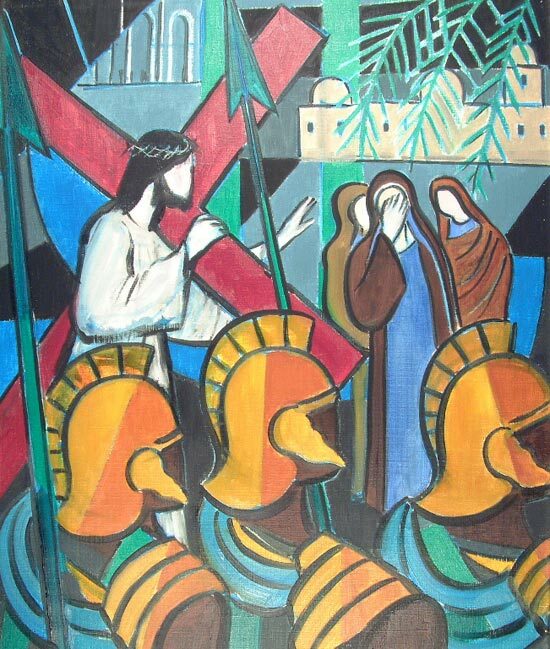 The palm leaves in the background remind us of the Palestinian environment and also perhaps of the triumphant entry into Jerusalem that had taken places less that a week previously. 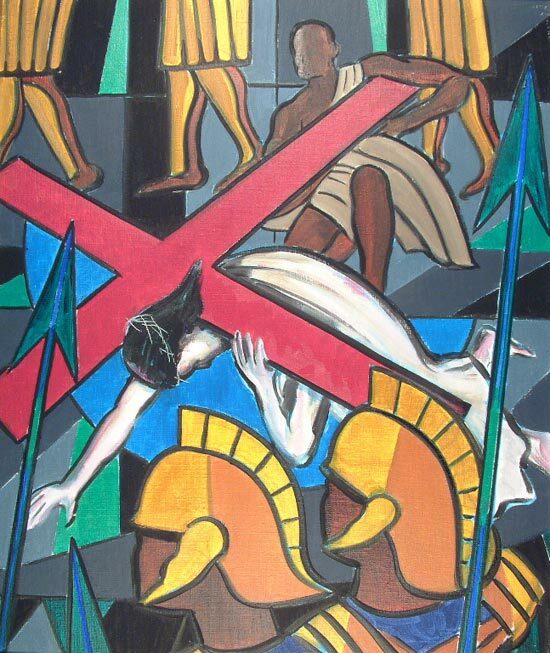 At the same time (and on the right of the picture) Simon of Cyrene has noticed that Jesus desperately needs help to carry the cross. More crowds begin to gather along the way of the cross and now with the extra help from Simon to carry the cross, the soldiers move more forcibly towards Golgotha and place of execution. The blue shape behind the cross begins to take more form and can be recognised as the shape of the priestly chasuble: the chasuble that will be used through the ages to celebrate the sacrifice of the last supper, and sacrifice of the cross for man’s salvation. 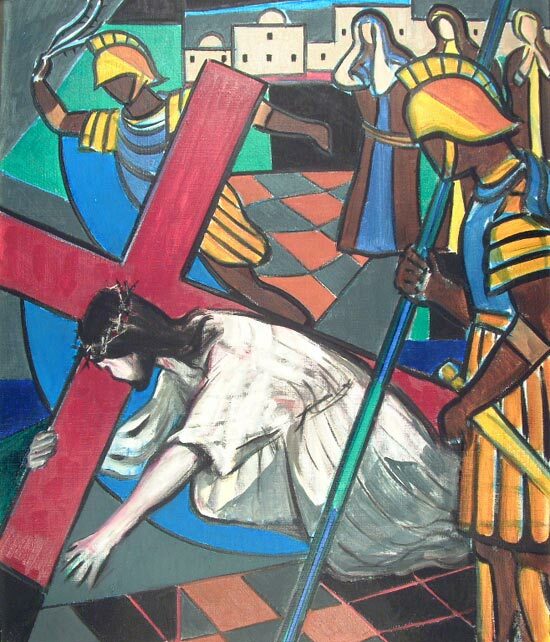 A woman ignores the soldiers’ curses and steps forward to try, in some small way, relieve Christ’s suffering. Using a white veil, which is slightly perfumed, she wipes the sweat and blood from his face. For her demonstration of love, Jesus blesses her sacrifice by leaving upon the veil a perfect image of his divine face, which glows with his reassuring presence whenever she looks upon it. 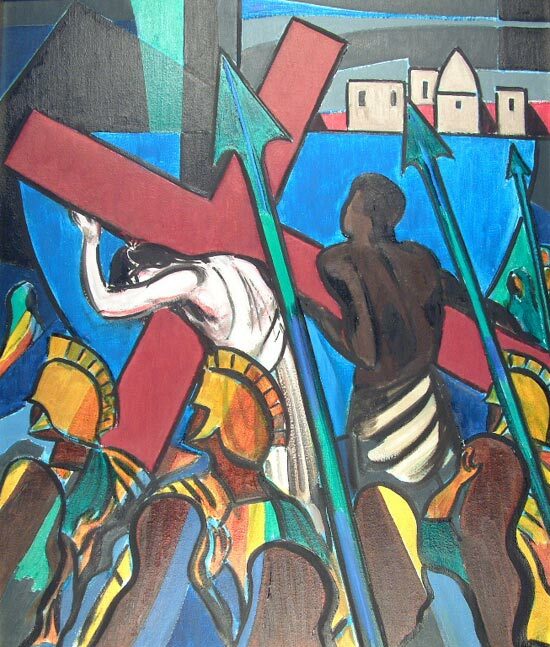 Simon of Cyrene tries to take some of the weight of the cross from the shoulders of Jesus, as in exhaustion Jesus stumbles again. Once again the soldiers hurry him to his feet, the menace of the military force seeming to surround him on all sides. His own disciples are afraid and keep their distance from the soldiers, but little groups of saddened and faithful women watch the sad spectacle. Jesus is moved by their loving concern and shows them that the critical hour is approaching not only now, but also in the near future, when judgement and condemnation will fall upon the godless. 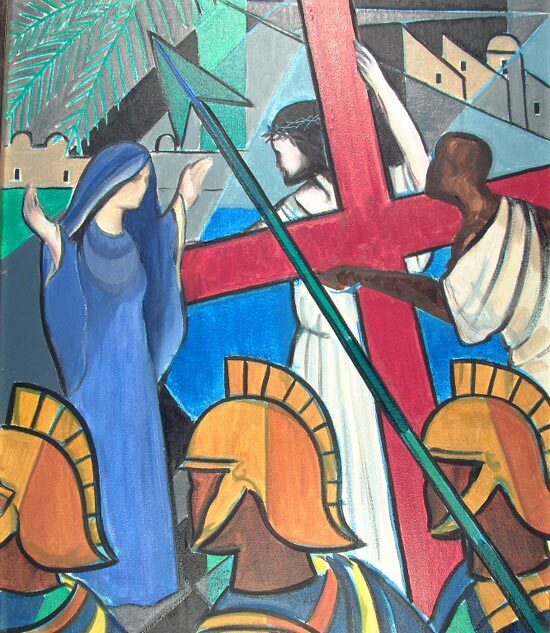 As when Mary met her son, so with the women, palm branches reach over their heads, as a reminder of the glorious triumph of this fatal journey. Hardly able to stand anymore, Jesus stumbles and falls. One soldier shouts at him, while another whips him across the shoulders until he staggers to his feet. Arriving now at the place of torture and execution, even the soldiers feel a little sick inside. They have seen many executions, but still are shocked at the excruciating pain their prisoners are about to suffer. One soldier holds out a rough mug of cheap liquid, which is supposed to dull the pain, while another soldier using bullying language, tries to console Jesus. The robes he was wearing are removed, leaving a modest strip of cloth around his loins. The palm leaves signify the beginning of the final momentous triumph, which is about to unfold. The soldier guarding Christ the captive no longer holds his spear or sword aggressively, but stands with his hands behind his back. He looks with pity at the terrible sight and views man’s barbarity, inflicted by one man on another. He senses that this man, Jesus is innocent and yet as a soldier he has to attend, watch and wait. Nailed and dying the world’s redemption is taking place. Too great for anyone to fully comprehend, except to know that it was done for us to bring us through life and death and to life again. 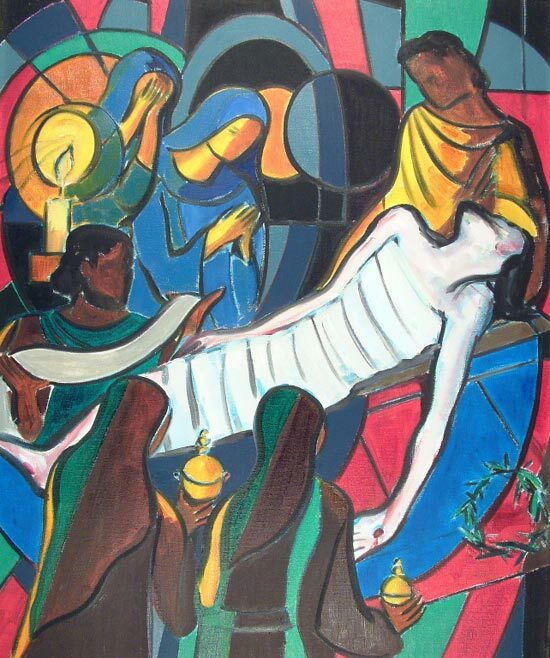 Some at the foot of the grave jeer at the dying Christ, but others stand in awe and reverence. Symbols that reflect the churches’ gifts are depicted: the chalice and the broken bread, the spear, the nails and the crown of thorns. Believers and faithful followers help to retrieve the body of Jesus. With gentleness and care the nails are withdrawn from his hands and feet. Simple sheets help to lower his form to the ground and seem to reflect his outpouring of life and love. 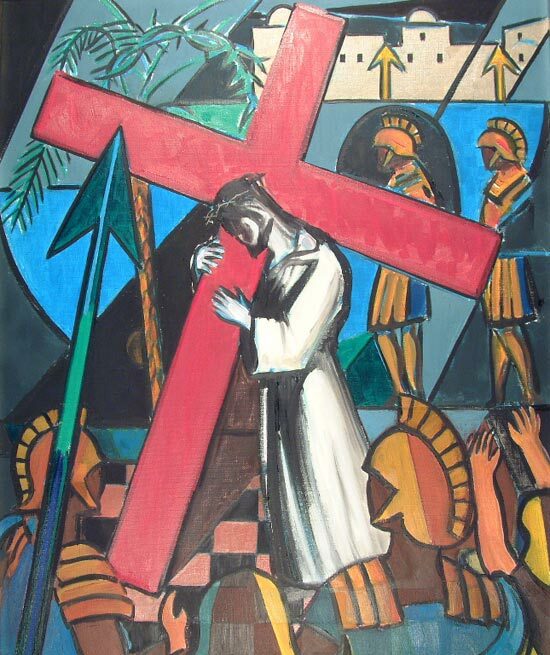 The final station of the cross lets us into the secret and holiest places of the way of the cross. Only the holy women and devout men obtain access at this moment. Christ is about to transform the whole of creation. Death has no dominion here. The light outside the sepulchre symbolises the light to come. The light of the candle symbolises the light already here. The women anoint his body with holy oils, which was the custom for a proper burial. Cloth is wound round him to preserve his body. Unknown to those present, his body would not need this precaution as it was already purified and about to be glorified where corruption has no place. The chasuble lies underneath as if it were holding him up. The sacrifice is complete, the priestly offering about to be perpetuated on earth, in all lands, in all times, until the final consummation in heaven. The crown of thorns on the right of the picture is laid aside; the glorious crown of the heavenly King is about to take its place.